Sony Conference in Japan - Vita news! Discussion in 'Console Games' started by Taustin Powers, Sep 9, 2013. So the first hardware revision is here! Lighter, slimmer, 1GB built in memory for save files, LCD instead of OLED. Curious about that last part - I'm sure we will get comparison shots soon! Been waiting for the first "slim" version, will buy this sometime next year along with my PS4. Also, a device called PS Vita TV. If I understand correctly, this plugs into your TV, plays Vita games and later streams PS4 Gaikai games, works with DS3/DS4 controller. Now, if I understand this correctly...if I'm on a business trip, I just need to pack this little gizmo and a DS4 controller, and I can remote-play my PS4 games on any hotel TV, provided there is WiFi?? If so, consider my mind blown. 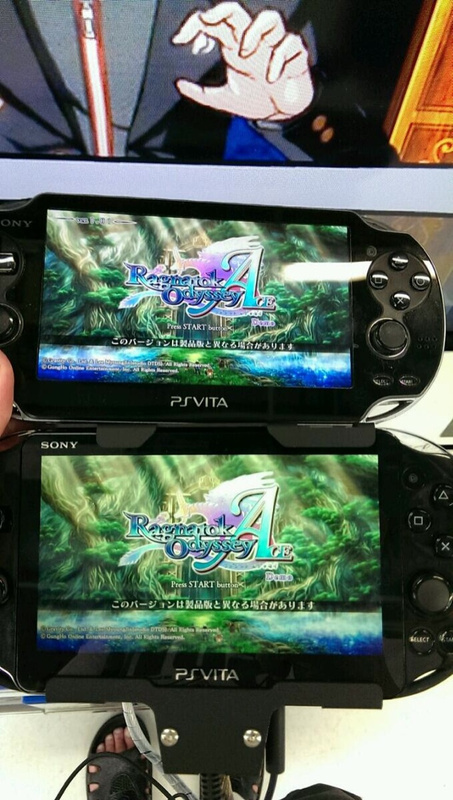 Was thinking about picking up a second Vita so I'll wait for this. Looks pretty cool. I was wondering whether this was going to happen or not, and Sony have timed it perfectly for the PS4 launch. Now I have an original model Vita, but the new one is of interest for the wife. Wish they would change the software UI from the bubbles though, and it'll be interesting to see OLED/LCD comparisons. The Vita TV on the other hand is insanely awesome. Vita games on my TV for the price of an AppleTV, whilst using a DualShock3? Amazing! Throw in the PS4 compatibility and it's a major winner...but only amongst certain segments of the gamer population. Definitely want to see an EU launch for this. Right after i buy Vita of course. Oh well, i'll use the RGB OLED in the original as consolation bragging right. I think this is just about perfect for business trips! I always stay in hotels with WiFi in the room, and if the PS4 remote play works as advertized, this will be incredible! Depends on firewalls though. I've found that a lot of 'public' WiFi (including hotels) are very restrictive on the ports you can use, which means things like this may not work. I can't access my Synology NAS' web interface on many public networks, because it's a non-standard port. Crazy that they're dropping the OLED, one of the best features of the system IMO. Interestingly if you take a screenshot of a Vita game and load it up on your computer, even on my calibrated lovely iMac display it looks quite shallow compared to the Vita screen! There's an amazing contrast with OLED, really rich dark colours are going to look bad on the new screen. Perhaps it's a budget version of the hardware, like the 2DS compared to the 3DS? Vita TV sounds great though. Might pick one of those up for PS1/PSN games on the big TV. At I believe $190 to $200 price that was hinted at it doesn't seem to be budget, just 2nd generation at the same price range. The Vita-TV is a great idea for people such as myself that will want to play the PS4 on multiple tvs. PS Vita-TV/PS4 bundle please. This thing needs to be DS4 compatible. Apparently it will be DS4 compatible with a software update when the PS4 launches - which may mean more Vita games become compatible as you can use the touchpad on the DS4 as a replacement for the Vita one. Vita TV is just a Vita without the screen? Play games, media, and online video services? I wonder what the benefit of this new one is then? Is it being thinner and lighter than much more important than that incredible display? My best guess is that it is cheaper for Sony to manufacture, and perhaps that price cut was a bit much for the old design and they want the Vita to be more profitable when units sell. Half of the games are garbage, but this still seems like a good deal? I knew OLED was pretty awesome, but that pic is pretty astounding. Honestly, I still think the Vita 2000 (or whatever they are calling it) is a good business move. If it can get the costs down to allow them to lower the price (hopefully in the near future), this will hopefully increase sales and in turn developer support/attention. Yeah. People complained about the Super-Slim PS3, yet it was made as that is likely the model Sony will introduce at a really low pricepoint - and they just did with their basic $199 model. And Plus currently gives you Uncharted, Gravity Rush and Jak&Daxter Trilogy for free! Any indication on USA release date is this going to be Fall 2014? And while I was trying to make up my mind about this, my wife bought it for me. Guess now I will have to sign up for Plus!